On 12th March 1933, the first and only election searching for a new town councillor after Hitler’s rise to power took place in the town hall. In this election, Hitler’s party – the NSDAP – achieved – in conjunction with another right-winger’s party (Deutschnationale) – 37% seats in total. The other seats were distributed as follows: the Zentrum got 32, the communist party gained twelve, the social democrats managed to receive nine and the so-called christlich-sozialer Volksdienst won one seat. On 26th May 1933, the SPD-councillors were forced by the SA (a paramilitary Nazi organization) to leave the town hall and therefore relinquish the representation of their voters. In addition, they were compelled to abandon their political engagements. Many of them got lost in the early concentration camps which were founded at that time. Further restrictions were implemented by the new fascist government in the months and years to come. The members and councillors of the communist party shared the SPD’s fate. There were arrested as well by SA-thugs and weren’t able anymore to make claims in their supporter’s place. After these unpleasant events, the NSDAP and the Deutschnationalen hold the majority. From this moment on, councillors were no longer voted but rather appointed by Hitler’s followers. After the handover of power in 1933 favourable to the Nazis, the latter increased the pressure on their political and ideological enemies. On 1st February 1933, just one day after taking over, the fascists dissolved immediately the German parliament, the Reichstag. A bit more than a month later, the freedom of speech just as the freedom of assembly were erased by Hitler’s entourage. The very same day, the 4th of February, the Nazis arranged the suppression of all district councils in Prussia (one of the leading states within the Weimar Republic). At the same time, they demanded re-elections. In the run-up to these elections, the Nazis put many of their leftist and/or democratic opponents in jails with regard to better results for the NSDAP, Hitler’s fascist party. Ironically, those arrests were traded under the name of protective custody (Schutzhaft), according to the Nazi’s lie just to „protect“ their victims in view of angry mobs capable to harm those being arrested – from this time onward, words such as Schutzhaft or Machtübernahme became unflattering tags. On 2nd May 1933 the Nazis shattered the trade unions. A little later, they forbid each other party apart from the NSDAP. Below the city center the administration of a branch of the concentration camp Buchenwald had its spatiality during the Nazi period. Nearby, in today’s town center, 150 prisoners of war were sentenced to hard labour in 1944. They were forced to clear off rubble, belonging to the wrecked buildings around them. According to the situation of cities during the aerial warfare, the Nazis exploited foreign workers – taking them away from their places of origin. These men and women sufferend from inconceivable repulsive working conditions. The Nazis made use of them and treated these workers just as „second-class“-citizins. Particularly in Essen, foreign workers were exploited in a large scale by companies like Krupp, whose leadership was partly common with Hitler. The Deutschen Erd- und Steinwerke GmbH demanded the work of the enforced, played the part of the client. The group of workers consisted of people from different countries. The majority of them were Poles (40) and Russians (90). The others were transported from France, the Netherlands, Belgium, Denmark and Luxemburg. The working camp where they were accommodated had an expanse of 350×100 metres. Due to the fact that the terrain was almost impassable, the Nazis had to employ a relatively great number of sentinels. One of the main tasks which had to be solved: the prisoners of war were induced to defuse unexploded bombs. Researches that took place two decades after the end of World War II offered an outcome barely surprising: the provisions for the forced workers were miserable, therefore many of them died of malnutrition. In addition, they lacked proper equipment to run the work they were condamned to do. 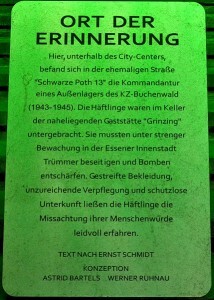 Finally, the camp was shut down in 1945, even before the Allies managed to free Essen from the Nazis. Unfortunately, the prisoners of war were deported to the concentration camp of Buchenwald. 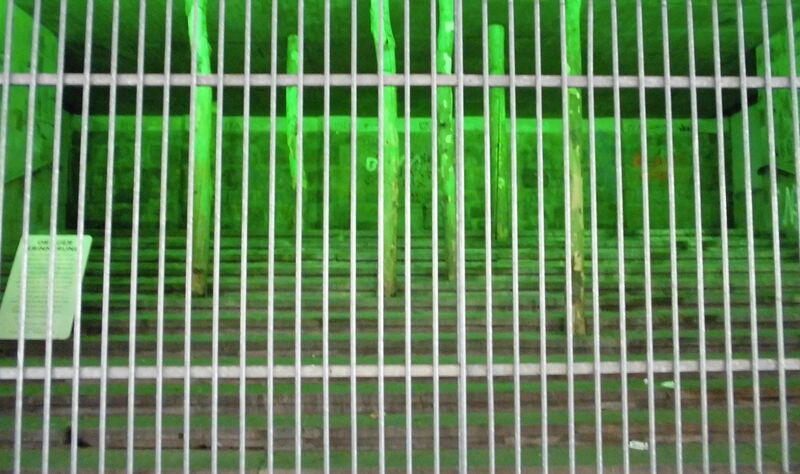 In 2002, Werner Ruhnau and Astrid Bartels created the memento Stadtwunde (engl. : „wound of the city“). Extra, there is a commemorative plaque which points out that horrible things took place here, for instance forced work beside inhumane ill-treatment of prisoners of war. The information given on this website date from „Lichter in der Finsternis“ (engl. : „Lights in the darkness„), a book with a progressive approach written by the Essener historical researcher Dr. Ernst Schmidt. It clarifies the involvements of so-called common people, getting somehow entangled in the pernicious deeds of the Nazi regime. One of the main advantages of this book is that it turns the spotlight both on people who served the rogue regime and on persons who resisted or even fought against Hitler. Through throwing light on the personal stories while holding consequently the view of the „ordinary“ people, the reader is enabled to put himself in the place of the victims of the Nazi regime. With recourse to this method, comprehension becomes more and more possible. 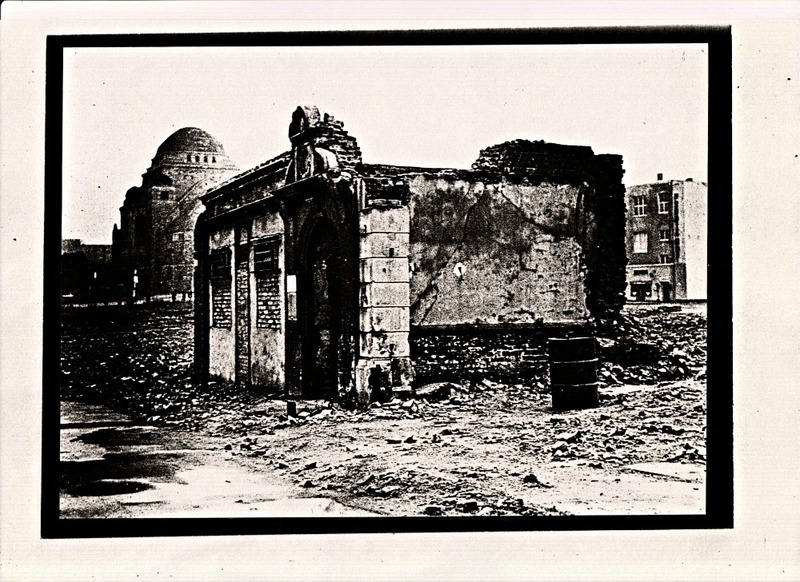 This photograph taken from the collection of Horst Zimmer illustrates the state of the town center in 1944. In this building, the administration of the camp has been housed. 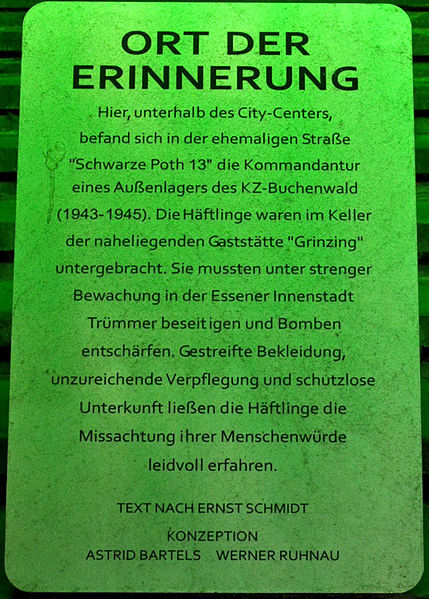 1) The „wound of the city“ remembers the victims of Hitler fascism. Do you suspect a certain thinking behind this expression? To what extent is it possible to talk about a „wound“ in this case? Do you find „wound“ a suitable title or can you image alternative terms? Write a brief text, trying to answer the aforementioned questions. 2) The Schwur von Buchenwald (engl. : „vow from Buchenwald“) is often headed with the exclamation „Nevermore fascism, nevermore war!“ Conduct an inquiry to find out what exactly the vow concerns. In a further step, consider useful methods to prevent the emergence of fascist ideas within society. Try to create a kind of a remedy.